James W. Korman, president of Bean, Kinney & Korman in Arlington, has been named the 2014 winner of the Betty A. Thompson Lifetime Achievement Award by the Virginia State Bar’s Family Law Section. The award recognizes people who have demonstrated excellence and integrity and have made a substantial contribution to the practice of family law in Virginia. The award will be presented during the section’s 30th annual Advanced Family Law Seminar on April 24, 2014, in Richmond. 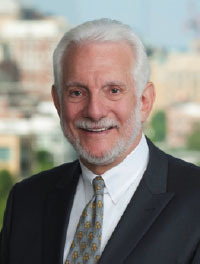 Korman has practiced law for more than forty-five years and has been with his current firm since 1967. He is a highly regarded litigator who has served as president of the Arlington County Bar Association, been a member of the Virginia State Bar Council, served on the board for the Virginia Commission on Women and Minorities in the Law, served on the board of governors of the Family Law Section of the VSB, and has served as president of the Virginia Chapter of the American Academy of Matrimonial Lawyers. He also is an adjunct professor of trial advocacy at George Mason University School of Law. He received his law degree from the George Washington University School of Law in 1968. He received his bachelor’s degree from the College of William and Mary in 1965.